This brief intends to provide an overview of the rationale underlying the EU-Africa Energy Partnership, in addition to an analysis of the potential implications of this policy on the development of sub-Saharan African nations. It is posited that the partnership could have potentially negative repercussions if critical uncertainties are not sufficiently taken into account, and that it is in the EU’s best interest to ensure that outcomes are genuinely equitable. The research also has implications for other developing nations around the world seeking to further their economies and raise living standards by means of engaging in the global biofuels industry. It is widely acknowledged that the energy security of the EU, as a whole, is deficient with respect to meeting future energy requirements. At the same time, the EU has resolved to de-crease its carbon footprint and wean itself off from environ-mentally damaging fossil fuels. A further concern is that even if the developed world manages to arrest the proliferation of greenhouse gas (GHG) emissions the developing world will still continue to pollute. Secure the EU’s energy supply and allow its member states to meet challenging emissions reduction targets. Provide sub-Saharan African economies with a further export market, in addition to allowing these nations to leapfrog to lower-emissions technologies. Although the partnership deals with renewable energy in its broadest sense, there appears to be great emphasis on the cul-tivation of biomass used in the production of renewable fuels such as ethanol and biodiesel, for which there is increasing demand within the EU. Despite the ostensibly sound intentions of the policy, it remains to be seen whether the energy partner-ship will truly be mutually beneficial. The aim of this brief is to examine the critical uncertainties that could potentially damage the workability and equitability of the energy partnership. A key consideration, here, is that the partnership has seemingly been formulated under ceteris pari-bus conditions. Thus, the partnership’s success is predicated on the continuation of existing trends, such as growth in bio-fuel demand and the ability to cultivate biomass at market-friendly prices in the future. Yet, the increasing complexity of technological systems, the advent and potential adoption of new technologies, in addition to climate change, means that it cannot be assumed that all things will indeed remain equal. The EU has set targets for biofuel usage within the member states. Policy measures designed to stimulate biofuel use were introduced in 1992. The overall aim has been to reduce the cost of biofuels in comparison with conventional petroleum products, which otherwise would be higher given the produc-tion costs and economic risk associated with fluctuations in oil price and the value of biomass-derived by-products (Cadenas and Cabezudo, 1998). The EU Commission set a political target of substituting 20 percent of conventional biofuels by 2020 (European Commis-sion, 2001, p. 45). The even more ambitious COM(2006)845 proposed that biofuel targets for transport fuel should be 20 percent for the same year. The EU Biofuels Directive (2003/30/EEC) requires member states to ensure that a mini-mum proportion of fuels sold are biofuels (see Faaij, 2006). The aim is to ensure that 5.75% of conventional fuels are re-placed by biofuels, although the Biomass Action Plan (BAP) has concluded that these targets will not be reached (Commis-sion of the European Communities, 2006, p. 6). There is thus a growing requirement for biofuel production within the EU and indeed a growing demand for biofuels (es-pecially biodiesel). Since the EU member states do not have the capacity to increase biomass cultivation without causing an increase in food prices (a politically unpalatable outcome), it has been deemed necessary to look for alternative ways to satisfy this demand. In this context, the EU-Africa Energy Partnership emerges as an important component of the EU’s aim to increase the use of bio-fuels for transport within the member states, thereby allowing the EU to meet challenging biofuel targets, contribute to global GHG mitigation strategies (such as Kyoto), and address concerns regarding energy security. The partnership is argued to be mutually beneficial, since it will also promote economic and social improvement in sub-Saharan African countries and allow such nations to switch to more environmentally friendly patterns of energy use. The partnership is intended to promote greater interconnectiv-ity between energy systems and ensure a diversity of energy options (Commission of the European Communities, 2006, p. 15). Although there is reference to alternative energy sources, such as hydropower (ibid. ), there is clearly an emphasis on greater biomass cultivation and biofuel production, perhaps to the detriment of other energy solutions. Energy security is obviously an important component of the partnership. Sub-Saharan Africa thus has the ability to sup-plement volatile supplies (and pricing) of OPEC oil with bio-mass cultivated in the region. Although the sub-Saharan re-gion is also clearly not especially stable, it at least has the ca-pacity to offset some of the risk associated with dealing with OPEC countries. Given the current high cost of second-generation biofuel pro-duction processes (which use the whole organic matter as a feedstock), it can be assumed that the bulk of the biofuel feed-stocks grown in sub-Saharan Africa would be used in arguably inefficient first-generation production processes. Here, only the sugars and starches (rather than the whole plant) are used for ethanol production, while only the extracted vegetable oil is used in biodiesel production (Charles et al., 2007). It is necessary to look at the critical uncertainties that could impact on the success of the EU-Africa Energy Partnership. The energy partnership, in as much as it relates to promoting sub-Saharan Africa as a source of biofuel feedstock, assumes that current climatic conditions will prevail. Yet climate change could mean that climatic conditions in areas currently suitable for agricultural endeavour might militate against prof-itable biomass cultivation. Increased uncertainty with regard to rainfall patterns: This will problematize when to plant and place pressure on water use, with potential social repercussions. Increased and more severe meteorological phenomena: Floods could wipe out entire fields; storms could damage or destroy harvests, while uncontrolled fires (resulting from co-factors of drought, thunderstorm activity or hu-man action) could do likewise. Increased incidence and severity of pestilence: Changed climatic conditions could make crops more susceptible to pests, thereby increasing the need to employ pesticides (with cost penalties and potential impact on the local envi-ronment and human health). These factors, when taken together, suggest that it will be more difficult to plan for weather-related phenomena into the future. Thus, claims of increased energy security within the EU resulting from the partnership need to be tempered with the realization that traditional agricultural techniques do not guarantee constant and predictable harvests, while climate change may exacerbate uncertainty. Agriculture has brought about widespread environmental deg-radation around the world. Thus, it is important to bear in mind the potentially negative impacts that intensified farming practices will have on ecosystems in sub-Saharan nations, in addition to the region as a whole. Increased use of fertilizers: Run-off from fertilizers in-creases the incidence of algal bloom in aquatic environ-ments; fertilizers lead to an increased level of atmospheric N2O harmful to the ozone layer; and fertilizer production and distribution is energy inefficient and contributes to greenhouse gas proliferation. Increased use of pesticides: Pesticide run-off pollutes local watercourses, results in a loss of biodiversity when food supplies for higher organisms are reduced, can flow throughout food-chains, thereby leading to chemical build-up in higher organisms, especially avian fauna; pro-duction processes and distribution incur GHG penalties, can be harmful to human life and can contaminate water supplies (of particular importance in developing nations). Increased threat of deforestation: Expanding biofuel mar-kets may prompt changes in land-use, potentially leading to deforestation, entailing significant biodiversity and CO2 penalties. These factors could be aggravated if a greater demand for bio-fuels in the EU member states is occasioned and if changing weather patterns result in a need to ‘make hay while the sun shines’. Such a demand could effectively see the EU exporting local environmental degradation from its member states to sub-Saharan Africa. Environmental degradation could also lead to opportunity costs resulting from a loss of potential eco-tourism income. Biofuels, at best, will be an important component in a future energy mix. There are no indications that biofuels will ever replace petroleum-derived products on a one-for-one basis (Di Lucia and Nilsson, 2007). Biofuels enjoy a clear advantage over other potential energy solutions, especially since they take advantage of existing infrastructural systems (Foresight Vehicle, 2004). This ensures that switching costs are reduced. On the other hand, there is the threat that biofuels will be ren-dered redundant by other technologies. There is much evi-dence throughout history to suggest that over-reliance on a single natural resource for a nation’s prosperity is not sustain-able over the long-term. For example, Chile, which prospered on the basis of its export of sodium nitrate (saltpetre), lost this advantage when scientists developed a synthetic alternative. Increase in use of nuclear energy (and thus ‘clean’ elec-tricity). Switch to cleaner second- (and third-) generation biofuel production processes. Development of a hydrogen economy (predicated on the availability of clean, renewable energy, such as from the sources listed below). Other energy paradigms, for instance, geothermal, hy-droelectric, photovoltaic, wind etc. Thus, over-capitalization in biomass cultivation for first-generation production processes (in particular) may lead to un-sustainable increases in foreign debt, in addition to severe job losses and resultant social upheaval. In a worst case scenario, more efficient technologies, if they become widely adopted around the globe, could lead to the biofuel industry’s collapse. Even if the biofuel industry remains important, over-emphasis on biomass cultivation could result in a failure to develop in-dustries that have the potential to contribute greater value added to sub-Saharan African economies. This would espe-cially be the case if insufficient attention were paid to process-ing the feedstock in sub-Saharan Africa, as could occur in na-tions traditionally focussed on exporting natural resources. Biomass cultivation, in the event of an ever-increasing de-mand for biofuels, would not merely translate into sub-Saharan African countries gaining an OPEC-like significance on the world stage. This is especially the case given a) the potentially wide dispersal of biomass cultivation and b) the high likelihood that biofuels would remain one of several al-ternative energy solutions. African biomass would also have to compete with that cultivated in North and South America, and also in South-East Asia and the Indian subcontinent. Given that these regions are already more highly industrialized than most sub-Saharan African nations, it is plausible that greater value added would occur in these regions. There is also a danger that biomass cultivation in sub-Saharan Africa could engender an increased dependency on multi-national corporations involved in agribusiness. There are al-ready substantial links to agriculture in developing nations and the research-intensive products, including seeds, support sys-tems and expertise, being offered by multinational agribusi-ness entities. Sub-Saharan Africa has a long history of supplying European nations with raw materials to be used in value-adding produc-tion processes. There is thus the potential for this situation to continue if Europe resolves to view the region merely as source of inexpensive feedstock for biofuel production, rather than as a knowledge-intensive producer in its own right. Many of the economic and social problems faced today in sub-Saharan Africa are deeply rooted in history. When the Euro-pean colonial powers partitioned Africa, they viewed the colo-nies as suppliers of raw materials for their factories. Farmland traditionally used for food cultivation, even after the inde-pendence of the former colonies, was turned over to cash crops such as cocoa, cotton, coffee and rubber. The result was that Africa exported what it did not need, and imported what it did, thereby leading to substantial trade deficits and continued indebtedness (Carmody, 1998). This is because the low price obtained for cash crops rarely if ever matches the relatively high price paid for imported food, in addition to luxury goods and hardware desired by affluent members of society. It is important to be awake to the potential for ongoing com-modity dependence to occur, especially if the EU pays insuffi-cient attention to developing sub-Saharan Africa as an energy producer rather than merely an agricultural supplier. It is possible to formulate a number of potential policy impli-cations that would add rigour to the energy partnership. Moving away from first-generation biofuels: A continued emphasis on first-generation biofuel production processes reinforces sub-Saharan Africa as a supplier of cash crops.There are inherent problems with first-generation biofuel production processes. A failure to address these and move demand towards more efficient second-generation proc-esses could lead to a global undermining of confidence in biofuels as a source of renewable energy. Ensuring environmental sustainability: This is tied closely to the previous consideration, but also with the necessity of preventing local and regional environmental degrada-tion as a result of poor farming practices or indeed wide-spread change in land-use. There is a need to develop mechanisms to ensure that increasing demand for biofuels within the EU does not lead to catastrophic environmental impacts in sub-Saharan Africa. Investing in sub-Saharan Africa’s future: The energy partnership should be used as a component in an overall strategy to enhance economic development in the region. A failure to do so will result in greater amounts of envi-ronmental degradation (including greenhouse gas emis-sions) over the long-term. In short, the nations of the region need to acquire their own energy security and processing infrastructure. The EU-Africa Energy Partnership must serve as a vehicle to promote these ends. To achieve this end, sufficient political will over the long-term to propagate cleaner biofuel production processes is required. If not, the biofuels market could be irreparably com-promised and the partnership with it, with grave implications for not only the EU and sub-Saharan Africa, but also the planet as a whole. Cadenas, A., and Cabezudo, S., 1998. Biofuels as sustain-able technologies: perspectives for less developed coun-tries. Technological Forecasting and Social Change 58(1–2), 83–103. Carmody, P., 1998. Constructing alternatives to structural adjustment in Africa. Review of African Political Econ-omy 25(75), 25–46. Charles, M.B., Ryan, R., Ryan, N., and Oloruntoba, R., 2007. Public policy and biofuels: the way forward? En-ergy Policy 35(11), 5737–5746. Di Lucia, L., and Nilsson, L.J., 2007. Transport biofuels in the European Union: the state of play. Transport Policy 14(6), 533–543. European Commision, 2001. Green Paper: Towards a European Strategy for Security of Supply. Directorate-General for Transport and Energy. European Commission, 2006. Communication from the Commission: An EU strategy for Biofuels—Impact As-sessment. Commission Staff Working Document COOM (2006) 34 final. Faaij, A.P.C., 2006. Bio-energy in Europe: changing technology choices. Energy Policy 34(3), 322–342. Foresight Vehicle, 2004. Foresight Vehicle Technology Roadmap: Technology and Research Directions for Fu-ture Road Vehicles, Version 2.0. The Club of Amsterdam set up an ‘Old and New Energy Lab’ designed to generate novel and potentially viable plans of action for dealing with energy issues by leveraging brainstorming methods to produce innovative thinking and bypass preconceived ideas and assumptions. The process tapped into the expertise of ‘thought leaders’ chosen for their diversity so as to maximise the fertility of discussions. Diminishing reserves of fossil fuels, climate change, geopo-litical factors and a wave of technological advances are bring-ing complex pressures to bear on the landscape of energy gen-eration and consumption. Change seems inevitable, but react-ing appropriately is a challenge. This is especially so when limited modes of supply and consumption have been en-trenched for extensive periods, as is the case with the energy landscape. This can make it very hard for people to think ‘out-side the box’ – arguably much needed at the moment.Thus the challenge addressed at ‘The Lab’ was to bypass pre-conceptions and traditional ways of thinking. Participants were called upon to brainstorm possibilities and then validate the resulting ideas with some tangible, realistic scenarios. Principal approaches employed were Socratic discourse and a future scenario method. Participants were asked to identify a set of driving ‘values’ deemed desirable (e.g. equal access to resources, freedom, quality of life, stability etc.). Socratic dis-course and other techniques were applied to open up discus-sion to the broadest possible level. The outcome was the ob-servation of numerous facts, trends, constraints etc. The resulting ‘facts’ were then fed into an analysis based on the future scenario method. The values identified earlier were used to drive the scenarios, which were to envision a positive future ten years hence (the goal being to identify possible so-lutions). 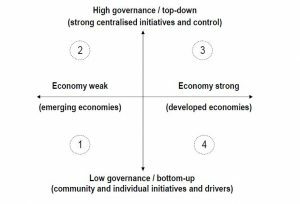 Four scenarios were created by choosing two drivers of change: governance and economy. Note that there is nothing absolute about the choice of drivers or even the number of drivers con-sidered, but these were the ones considered most important. These drivers define the axes of a graph depicting four different environments (symbolized by the numbered circles in the diagram)derived from the possible combinations of extreme cases of both drivers. These environments provided the basis for the scenarios. Keep in mind that these scenarios are not predictions but simply tools to guide discussion from exploration to identification of potential solutions and analysis of important trends and factors (political, cultural, technological, etc.) and their interactions. Observations on trends and forces will be split into socioeconomic and cultural, and technological and sectoral. The four scenarios based on these trends and forces will then be outlined before looking at identified opportunities and challenges, which are in turn fed by the scenarios. Concern about climate change (global warming). Increasing sensitivity to energy supply disruption. Concerns over energy dependence and vulnerability. Impending scarcity of fossil fuels with increasing demand from rapidly advancing nations such as China and India. Increasing global tension relating to energy supplies and the possibility of resulting conflict. Environmental concerns about nuclear energy. Increasing interest in alternative energy sources. Increasing interest and efforts in energy conservation. Development of carbon trading schemes. Capability (in some markets) for energy purchasers to also sell to the grid. Choice (in some markets) over source of energy bought. The nanotechnology ‘revolution’ impacting multiple, interacting energy-related technologies. Multiple parallel and rapid advances in solar technologies promising greater efficiency and/or lower cost. Advances in fuel cells (in many sectors). Advances in batteries and ultracapacitors. Developments in thermoelectrics offering promise for waste heat reclamation and geothermal energy. Availability of smart energy-saving materials (electrochromic or anti-IR window coatings etc.). Lighter/ stronger metals, ceramics and composites. Efficient lighting (especially nanostructured LEDs). Improvements in coal/gas/biomass-to-liquid processes, often driven by improved technology (e.g. nanocatalysis). Advances in hydrogen production and storage. Potential developments in artificial photosynthesis. Potential for low-loss electrical transmission. Four scenarios were framed assuming environments as described in the methodology section. Remember that they are designed to be optimistic views of a situation ten years hence. Their creation allowed disparate ideas to be brought together in a framework where interactions and socio-economic and political realities could be considered. Not all the scenarios were recorded in the same degree of detail. Different groups of participants chose different styles of presentation. The environment envisaged was a poor, sub-Saharan country with village communities as the dominant settlement pattern, poor access to resources and minimal infrastructure. The village in this scenario was assumed to be remote but not overly far from a principal city. The one plentiful resource is sunshine. New cheap photovoltaics and microloans allow the village to produce electricity. This gives rise to increased productivity and enables more flexibility in trading of staples such as vegetable and meat produce through refrigeration. The small economic boost and decreasing costs of photovoltaics allow expansion of generating capacity. Direct energy sales become attractive in a future where fossil fuel is expensive and supplies unreliable and the village becomes a supplier of power from solar energy. Improved battery technologies and high fuel prices lead to more electric or hybrid vehicles. Households in and outside the village increasingly use batteries and pay for recharging. The village has effectively shifted from subsistence agriculture to ‘farming’ sunlight, with batteries as the means of distribution. The availability of power for transport attracts more vehicles and infrastructure improves. Then cables are laid to directly supply electricity to the nearby city. After all, the village now has the generating capacity, the expertise, and plentiful lowvalue land for expansion. Infrastructure experiences another boost, including communications. The village buys computers and the community now has Internet access. Educational opportunities increase dramatically. Over time the community becomes generally well-educated and thus capable of engaging in even more diverse and complex commercial activities. Some time in the future (although maybe not in the ten-year frame), solar energy could be captured in a fuel created by artificial photosynthesis, allowing wider export of energy and opening up the solar farming model to more remote communities. This would require importing water (limiting displacement of battery use), but importing water is certainly preferable to importing oil in this (future) day and age. This scenario assumed a top-down, centrally-organised society with an emerging economy. China was offered as an example, on the assumption that much of the traditional communist philosophy still permeates the government, which regulates the allocation of resources. Short-term (business) thinking is constrained for the benefit of the collective when it comes to something as fundamental as national energy supply. The immediate need for more energy to support growth is urgent. Coal is abundant and coal-fired power stations proliferate, with little thought given to environmental concerns. But this is only the first, quick fix, part of the plan, which is also influenced by oil imports for vehicles, the need to transport energy over great distances and the fact that even coal resources have limits. Coal-to-liquid processes are used to produce clean diesel to help ease the dependence on oil imports, while a massive research effort creates low-loss electrical transmission based on high-temperature superconductors (doubly important because of the chosen alternative to coal – photovoltaics). Huge solar ‘plains’ grow in the country’s remote, arid and impoverished west, bringing employment and commerce. Ultimately, the technology becomes simple plastic sheets that can be rolled out and clipped together. They contain nano-engineered structures that exploit the highly-efficient initial step of photosynthesis but feed the liberated electrons into the superconducting transmission lines and on to the energy-hungry coast. China soon becomes a major exporter of these technologies. In the cities of the East, electric and hybrid cars are encouraged and manufactured. Coal is increasingly used only to produce diesel and dependence on foreign oil now rapidly disappears. Sweden, which aims to become oil-free by 2021, might be an example. A progressively increasing carbon tax is introduced for individuals and corporations. A flexible power supply network allows individuals to avoid a carbon tax by purchasing energy from sustainable sources. This encourages development of such sources – from the logging and papermaking industries using waste to produce electricity, heat and biofuels, down to individual households generating energy and selling any surplus to the grid. Central support and legislation for energy-saving technologies in housing and transport increases their uptake through various means. The carbon tax imposes a cost on manufacturers for the lifetime emissions of their products. The tax alone triggers substantial change, but more comes through governmentdriven, large-scale geothermal, hydroelectric and combined heat and power schemes. This scenario is one of change through popular movements. Analogies might be seen in the growth in the popularity of ‘organic’ produce or that of ‘fair trade’ products, both of which evolved out of grass roots concern. For instance, we can help the environment by buying local produce rather than that shipped great distances, or eating less meat (such unlikely action probably highlights limits to this approach). Other individual contributions are switching lights off, car-pooling, capturing rainwater to water one’s garden or carbon offsetting schemes. The key is understanding what can be done and creating a culture of willingness and responsibility. Communication is key and the Internet makes this possible as never before. To some extent this scenario is happening now, but there are clearly limits to how much it can achieve without some topdown initiatives (or economic imperatives) added to the mix. perhaps best illustrates the dramatic achievement that might be had given only certain technological advances. Many other scenarios are possible, of course, and those developed were deliberately positive. But the consensus at The Lab was that all the scenarios were credible, so they probably do represent real opportunities. Despite much disagreement about how close ‘peak oil’ is, all seemed to agree that action is needed now to reduce the developed world’s dependence on oil. Different environments are likely to beg different solutions and the diversity of technological developments that bear on the issues prevent simple answers and argue for multiple alternatives to be investigated. The variation across the scenarios developed suggests that multiple approaches will be needed in parallel, covering conservation, alternative forms of generation, and storage and transmission technologies. The best solution or combination of solutions for a given region will vary with external factors (climate, population density, access to water, etc.) and with developments in numerous interacting technologies. The appropriate focus can vary dramatically depending on the existing situation. For example, a focus on coal in the short-term is sensible for China, if the aim is energy independence, while France might see nuclear in a similar light. In lower latitudes, solar energy will be more quickly economically viable than in higher latitudes, where geothermal may be a better choice. In all cases, conservation makes sense as a priority and gives the most rapid return on investment. Given this diversity and uncertainty, it seems sensible to recommend broad investment in energy-related R&D and a systematic, inclusive, and iterative analysis of the energy situation at regional scales. It is worth noting that only two currently achievable sources of energy are sufficient for global needs in the long-term and truly sustainable. They are solar and geothermal energy. Areas of technological focus to be considered are just as diverse – see section 2 on technological and sectoral trends. The ramifications of energy supply disruption and the time needed to change our infrastructure suggest that appropriate change cannot be expected to arise from market and social forces. Accordingly, governments need to be a key player in developed countries. Proactive action from government is almost certainly necessary to avoid the risk of severe economic disruption. Much of the rest is down to technological developments and their impacts on the economic competitiveness of certain technologies. Though solar emerged from the Lab as the winner in terms of chief long-term global energy sources, the means of capturing it, transporting it and using it produced no clear favourites. The range of possibilities from domestic to industrial to automotive applications in a diverse range of environments suggests that all avenues of research should be actively explored. Since solutions will likely be more complex than the current rather monolithic systems, flexibility, interoperability and rapid adaptability are critical success factors. When tackling the issue of poverty on a global scale, there may be a possibility of achieving much with little (Scenario 1), given certain technological shifts. Club of Amsterdam, Lab on Old and New Energy, April 17 and 18, 2007, in Girona, Spain. Paul Holister – technology impact consultant. Humberto Schwab, director of the Club of Amsterdam and innovation philosopher, led the process.